1- A summary of the situation in Lebanon before the war. The March 8 coalition, made up of Hezbollah, the Amal (Hope) Movement (historically the first movement to defend Shiite interests) and pro-Syrian parties (the Syrian Social Nationalist Party, ex-Minister Sleimane Frangié’s Marada current - Christian Nationalists). General Aoun’s Free Patriotic Movement joined later (nationalist, multi-confessional and originally anti-Syrian). The March 8 coalition is opposed to a sudden break with Syria and rejects United States policy in the region and Israel. The March 14 coalition, which constitutes today the parliamentary majority, includes almost all remaining political forces, i.e. Saad Hariri’s (the son of the assassinated ex-Prime Minister) Current for the Future (ultra-liberal), confessional leader Walid Jumblatt’s Progressive Socialist Party, the Lebanese Forces (Christian far right), the Democratic Left (a new left party that formed in part after the split of the Lebanese Communist Party, situated somewhere between moderate anti-liberal and social liberal. The March 14 coalition is in favor of a rupture with Syria (a “new balance of relations”) and an alliance with the United States and France. The activist or dissenting Left is divided between these two currents, with some minor groups not taking sides. 2- The July War, or state terrorism. On July 12, 2006, following a chain of events taking their origin in the inhumane Israeli occupation of Palestine, the Israeli Government decided a series of “reprisals” against Hezbollah, which quickly turned out to be an operation of systematic destruction, and which in Lebanon is now called the July War. It is useful to briefly recall the context: for nearly 40 years, Israel has occupied the entire territory of mandate Palestine, in addition to the Syrian Golan Heights and parts of Lebanese territory. In what is known as the “occupied” territories (the West Bank and Gaza), Palestinian people today live in the world’s largest prison under one of the world’s worst prison systems, and this affects a population of almost 4 million inhabitants including families, universities, and all the worth and complexity of a modern society. Every act of resistance (whether peaceful or violent) is punished with extreme brutality. In June a Palestinian armed group kidnapped an Israeli soldier at Gaza’s border, resulting once more in a deluge of fire power. A few weeks later, there was an encounter between an Israeli patrol and a Hezbollah armed group. Hezbollah killed several Israeli soldiers and kidnapped two, with the aim to exchange them for all 17 Lebanese prisoners held by Israel. This type of exchange had taken place many times before since the last major Israeli attack on Lebanon (April 1996). Some commentators consider this to be “the first act of military solidarity of the Arab world towards the Palestinian people” [Tanya Reinhart, Politis, 27 July]. But the Israeli response was incredibly violent. During 34 days of terror, the whole Lebanese territory was subjected to continuous bombing, without pause or a break for humanitarian purposes. 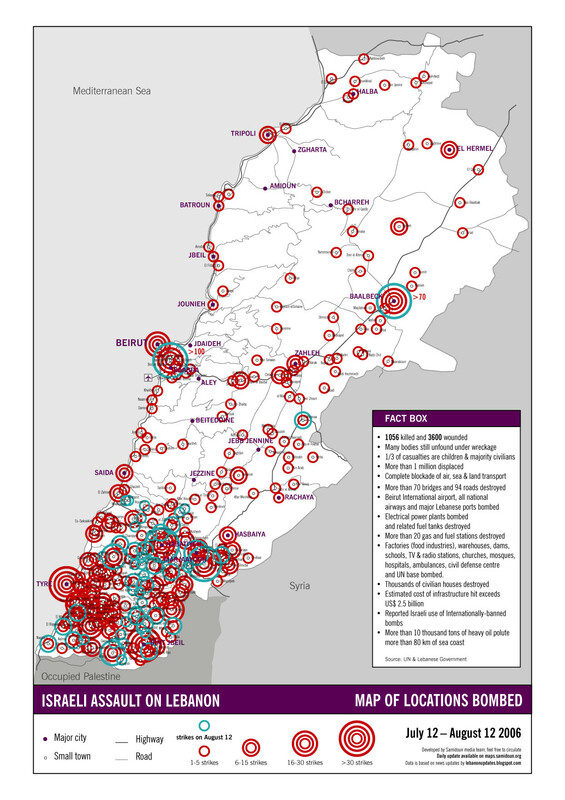 Areas known to be Hezbollah strongholds (a party of the masses in Lebanon, particularly within Shiite popular classes) were the focus of a burnt earth policy, and entire residential neighborhoods in very dense areas (particularly the southern suburb of Beirut and the south of Lebanon) were devastated. Hezbollah reacted to these bombings by bombing the north of Israel, as far as Haifa, a town with a large Arab minority. Paradoxically, the Arab population, typically poor in Israel, payed a heavy tribute. The human toll was very high: over 1200 deaths and thousands of wounded in Lebanon, almost all civilians and a third children under age 12. In addition to these victims, 1 million refugees (a quarter of the population (at the height of the aggression). In Israel over 100 deaths, soldiers for the most part. Based on the overall death toll alone, it is justified to qualify, the Israeli attack as state terrorism. The human toll is even more harsh and cruel considering with what precision the Israeli army bombarded selected infrastructure: it is evident that every target was hit intentionally and that the safety of civilians was not a concern, and that civilians and civilian infrastructure that happened to be in the wrong place at the wrong time were not spared. 3- The surrealistic economic toll. All of the country’s harbors and airports were hit or destroyed. The biggest oil slick in Mediterranean history and along with the numerous factories bombed will cause respiratory problems in the population. 30000 houses (a quarter in the southern suburb) destroyed. 80 bridges destroyed (for a country 200 km long and 50 km wide), and many kilometers of roads made impracticable. Thousands of unexploded ammunition as well as cluster and submunition bombs (most of them dropped during the last two days of the war, when the cease-fire was in place) preventing access to numerous fields. Many factories hit, including dairies and production facilities for things like handkerchiefs and plastics. Supermarkets destroyed by incendiary bombs (ruining the entire stock). Hezbollah’s military and economic infrastructure damaged, but it is difficult to evaluate with accuracy the real losses. It is likely that this infrastructure has already been or is being recovered. The economic toll is astounding (the following figures come from studies undertaken by the Lebanese High Council for Reconstruction and Development and Amnesty International). The country’s global economic losses amount to 9,5 billion dollars (half of the GDP), among them 2,5 billion dollars in material losses (which will take 6 months to 2 years to recover), and 0,5 billion dollars in agricultural losses. Instead of the 6% anticipated, there will have been no economic growth in 2006. To this must be added weeks and months of unemployment for hundred of thousands of Lebanese engineers, civil servants and farmers as a result of the country’s paralysis during one month of war and the ensuing one-month blockade. From 1968 (date of the first Israeli attack against Lebanon) to 2006, Israeli “actions” in Lebanon have resulted in 24,000 dead, 49,000 wounded, 4,5 billion dollars in material damages and a 25 billion dollar loss for economy. The only thing unifying an overwhelming majority of Lebanese people is their condemnation of Israeli state terrorism. For this reason, internal politics were relatively quiet during the attack, and we witnessed a union and exemplary solidarity between Lebanese people of all convictions in face of the aggressor. Now that it is time for a post-war assessment of the country, views are diverging and previous divisions are growing. Hezbollah has proclaimed victory, and indeed, one month of war showed the world the heroic resistance by a few hundred (or thousand) Hezbollah fighters and militants, armed essentially with light weapons, facing one of the most powerful armies in the world, tens of thousands of overarmed soldiers using heavy, ultramodern equipment. The Israeli ground attack was a failure, and consequently an impressive victory for Hezbollah. The fighters earned universal praise for their bravery. The party’s victory was the result of hard struggle, which brought it unprecedented fame in the Arabian world and throughout all Muslim countries, - in all their diversity-, for its “double defeat of Israel”. M. Nasrallah, the party’s General Secretary, made an eloquent speech that pointed out the cowardice of Arab governments, only interested in their regimes’ survival. He used the opportunity to praise the only country in the world that undertook action against Israel: Chavez’s Venezuela, which recalled its Ambassador. It is clear that Hezbollah sees no interest in laying down its arms and does not intend to do so. On the other hand, Israel’s superior military encountered no resistance in the air and on the sea. Lebanese skies and coasts remained under Israeli control throughout the conflict. The Israeli army did exactly as it wanted, when and where the strategists decided. This superiority resulted in the destruction of Lebanon mentioned above and led other parties to say the country had been defeated. Disagreement over victory or defeat has led to more polarization, not only on the issue of Syria but also about Hezbollah’s weapons. The backdrop is Lebanon’s relations with a Syrian neighbor, Iran and also with France and the US further away. Both sides accuse each other of treason and of working not for the country but for foreigners to the east and to the west. The tone rises and falls continually, aggravated (on purpose?) by the foreign authorities in question, eager to take on the matters of a country that has never been able to keep itself free from foreign influence. Only the economic policies of privatization, liberalization and a weakening of the state were still intact after the war and the difficult events to which Lebanon was subjected. The present government is a coalition between the parliamentary majority (March 14), Hezbollah and Amal. This government has continued ex Prime Minister Hariri’s policy: a policy that sells off the country to various multinational interests. Privatization processes (or the delegation of public services) are underway to varying degrees in all economic areas: telecommunications have been privatized, postal services are partially privatized, Lebanon electricity (EDL) is in the process of privatization as well as Beirut airport, etc. One of the first things said by the Minister of Energy, Mohamed Fneich (also a member of Hezbollah), after he took office was that he would see to it that EDL’s privatization moved forward. The present period does not escape this tendancy. Already there are allegations that the coastal clean-up will be privatized. In fact, activists from Greenline, a Lebanese ecological association, were driven back from the Jbeil coast (50km North of Beirut) that they were starting to clean. An exclusive contract for the clean-up had already been sold. A part of the left has rallied, via the March 14 Movement, to the parliamentary majority that supports these policies (although up to now no vote has taken place in the Parliament since the previous elections). Unfortunately, this alliance of convenience has sometimes led to self-censorship since, in the name of unity during an emergency (necessary according to them in the face of Syria) everyone avoids criticizing the majority. Hezbollah’s attitude towards this government is very ambiguous: it is a member of the government coalition whose economic policies it supports, and it is in the parliamentary opposition and strongly criticizes government choices in international policy matters. It also is a substitute for the government in many areas of the country, mainly Shiite, historically abandoned by the central state. In fact the Shiites are the great losers in Lebanon’s economic development, because they constitute a peasant population in a country that was built around towns and services. Israeli occupation in the South (mainly Shiite) has only aggravated the situation. Hezbollah has progressively built schools and social and health service networks which are welcome because this fills real needs. But there is a big difference compared to public institutions: the schools are religious ones and the party itself represents neither the Lebanese people, nor the Shiite majority. Hezbollah defends a conservative vision of society and, even if it is far from being the terrorist movement described by commentators who’ve never been to Lebanon, it is certainly not progressive, anti-capitalist, or anti-neoliberal. Part of the extreme left and protest movements are invariably critical of this party, which is considered (with good reason) to be populist and reactionary. 6- The difficult position of constructive criticism. Various interrelated alter-globalization groups (among them the emerging Attac group) are trying as best they can to maintain a capacity of critical dialog with the different players. It is important that the defense of national independence, whether against Iranian or American conservatives, or against the Syrian regime, not be achieved at the expense of an independent secular state where services and infrastructures are kept public. Although numerous malfunctions do occur, it is only by staying (or becoming) public that services can be improved and communities can have a say in how they are managed. Attac works in this context to provide information about the neoliberal policies being imposed against better judgment: membership in the World Trade Organization (at incredibly unfavorable conditions), rapid growth of the debt, privatization without debate or a chance to propose alternatives, dismantling of weak social protections. This is a big task, but the movement will be big too, we hope. Coalitions are being set up, for instance “Lebanon is not for sale”, a coalition looking at WTO and free trade agreements that includes several Lebanese NGOs (Attac, Greenline, Arab NGO Network for Development, Humanitarian Group for Social Development, The Social Movement etc.). As French-Lebanese historian Gérard Khoury has rightly stated, conflicts in Lebanon cannot be explained without analyzing three interconnected levels: local, regional and international. By necessity we limited it in this article to the local level (with some mention of the regional level), but the reader must not think that the local level is independent from the other two. It is particularly necessary to consider the consequences of Resolution 1701 and the deployment of the new UNIFIL (United Nations Interim Force in southern Lebanon). Here are some leads on a more global level. This offensive must be seen in the context of the militarization of globalization and the intent of “western” elites and their allies to grab the biggest prizes. The offensive had various and sometimes unexpected winners, and they are listed here for subsequent deeper analysis. On the domestic front, Amir Peretz was elected on an anti-neoliberal program, but the Government he serves as Minister of Defense has abandoned the reforms he previously attempted (or pretended to attempt). As always, the state of emergency which has characterized Israel since its creation prevents any form of social dissent. The weapons industry was revived, as well as the state military budget. Several factories hit in Lebanon belonged to Arab or Lebanese firms who were competitors of Israeli firms on the Iraqi market. The reconstruction of Lebanon has mainly been assigned to multinational firms with European capital (for instance Bouygues, Holcim). Arab (and of course Lebanese) firms received reconstruction contracts on a much smaller scale. Privatization, the inevitable consequence of debts to come, will likewise mainly benefit European firms. A continuous weakening of the state opens up new markets. One current example has to do with the quality of water. Water infrastructure has obviously suffered over the past few months. Some years ago the world leader of bottled water, Nestle, bought the Lebanese leader of mineral water and now bottles it as Nestle Pure Life, and it already replaces tap water in many homes. When George Bush talked about Lebanon he used an incredible but revealing formula: “the third front against terrorism”. Apparently the US regime needs this third front — for Patriot Act 2? For the US weapon’s industry? We shall see. Granting ”aid” (subject to conditions of use, “transparency” and economic criteria) is ultimately a good bargain. And the offers by states to rebuild entire cities are not made in a disinterested way! Reconstruction will benefit Lebanese economic elites as much as their European partners. These of course are just leads.